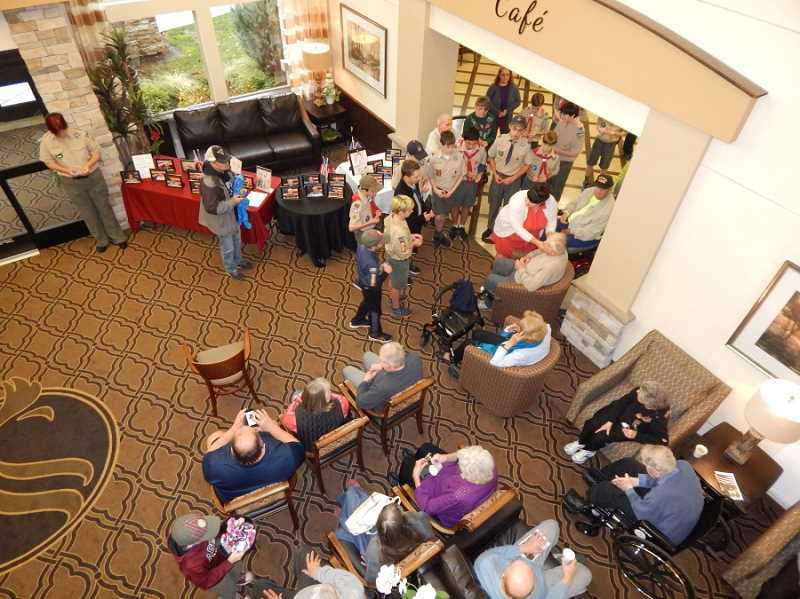 Bonaventure in Tigard threw a spectacular Veterans Day celebration for its veterans. "We are so blessed to have 53 veterans living under one roof," said Executive Director Lana Buckles. The ceremony started Nov. 11 when Boy Scouts raised the flag in front of the facility, and then the celebration moved indoors. The spacious lobby had been turned into a giant living room with extra chairs brought in for veterans and guests. 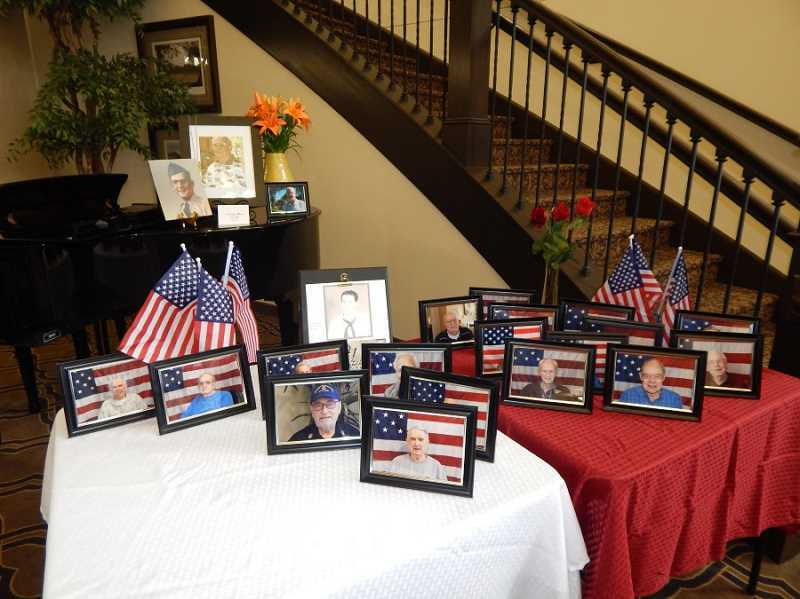 And colorful photos of every veteran in front of an American flag were positioned around the room. 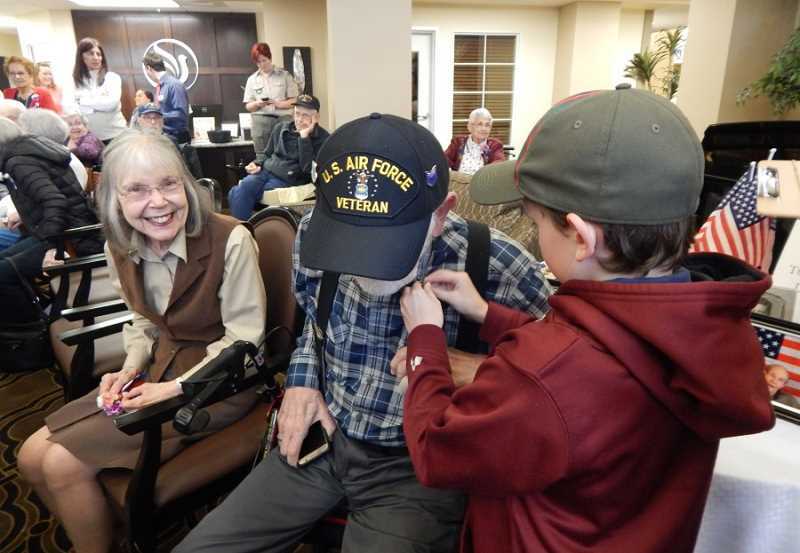 Buckles and the Scouts went through the room pinning an American flag lapel pin on each veteran and asking them about their service, and each wife was presented with a miniature bouquet of fresh red and white flowers held together with a blue ribbon. "We are honored to have you here every day," Buckles said. "It is a blessing and an honor to serve you." Among the residents in the room were former Summerfield residents Ralph and Nancy Burnette; Ralph served in the Air Force from 1953 to 1963. At lunch the Burnettes were joined by another former Summerfield resident, Jackie Morgan, whose late husband was a Navy pilot. "Their plane was shot down off Australia," Morgan said. "My husband and one other man survived on a raft for two days before they were rescued." Following lunch, the Boy Scouts retired several U.S. flags outside the rear of the building by respectfully burning them in a fire.